Tonight I braced myself for the usual groans of displeasure. "Baked fish." But instead of just complaining about the menu choice, Doodle suggested jazzing it up: how about fish tacos? And you know what? Turns out it wasn't that crazy an idea after all. I found a quick and easy recipe and within the hour, we were noshing on a delicious, flavourful and kid-friendly meal. I couldn't get over it, and kept exclaiming, "Wow, this is good. I mean, this is really good. This is GREAT!" The silence at an otherwise rowdy dinner table and the subsequent empty plates assured me that yes, the kids liked it, too. It can be done, folks! Preheat oven to 425F. Coat a baking sheet with nonstick spray. Mix mayo, seasonings and lime juice together. Place cornmeal in a separate, shallow dish. Combine the fish and the mayo mixture until evenly coated. 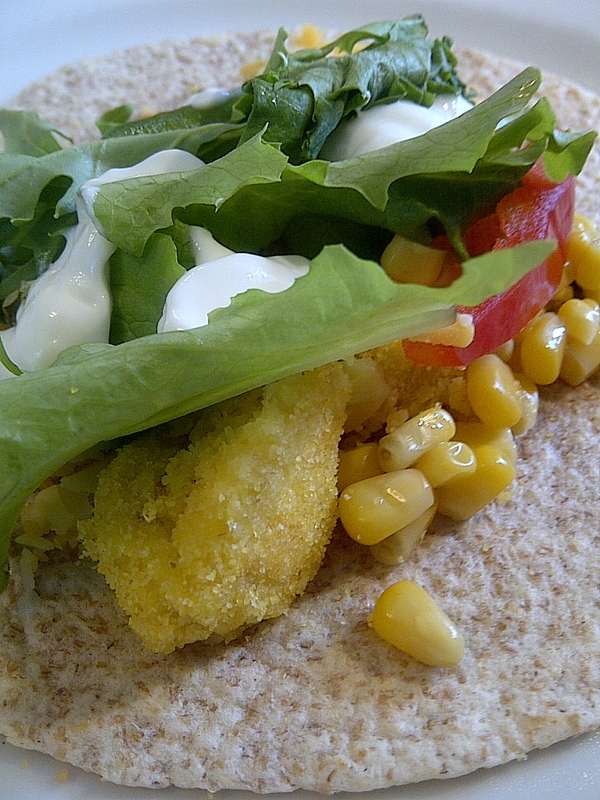 Gently roll each piece in cornmeal until covered. Place chunks on baking sheet and lightly coat with nonstick spray. Bake until browned and cooked through, about 10 min. Combine all ingredients in a glass bowl and let sit while the fish cooks. Spoon liberally on your tacos. Pairings: We had ours with a couple of ice-cold Coronas, but I could see this going really well with a crisp white, either a torrontes, sauvignon blanc or unoaked chardonnay. Fragrant and sweet would also make a good match: gewurztraminer, or a blend like Obsession or Strewn Two Vines.